I apologize to you if you’re interested in history, but not the Digital kind, especially. The past several posts have undoubtedly glazed your eyes, and those of most readers, I should think. Let’s get back to another of the notable people of Antietam and a quick look at history from her perspective. 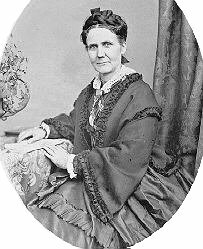 This dedicated looking woman is Isabella Fogg, a volunteer with the Maine Camp and Hospital Association, and mother of a soldier in the 6th Maine Infantry1. On the first of November 1862, about 6 weeks after the battle of Antietam, she ventured out from Washington DC to observe the conditions of the sick and wounded troops around Sharpsburg, and to do what she could for their comfort. Her letter back to John Hathaway of the Maine Relief Agency describing the expedition gives a glimpse of what she found. What strikes me as I read is the fundamental neglect she witnessed at many of the more remote hospital sites. The lack even of essentials like shelter, clothing, and food, let alone medical care is startling. Hardly what I think of when I picture a hospital. How I wish I could introduce you, and the Washington Com2. to Smoketown Hos.3 in the midst of this driving snow storm! You could have seen the poor fellows huddled together, with their pallets of straw on the gound, their tents connected by flyes, the same as erected in the heat of summer, many without walls and no stoves. Those who were able to creep out of their tents were crouched over fires, built in the woods, their heads covered with snow. And all I may say, almost without exception with thin muslin shirts on. – The exposure has been such that diptheria has broken out among them, and in nearly every case proves fatal. One of our poor Maine boys who had been very diligent in looking up for us those belonging to Maine, at our last visit had been seized suddenly with diptheria, caused by exposure, and lived but two or three hours. – Distributing what few articles we had received from the Commission among them, we moved on, deeply regretting we had no winter clothing, as many of them were destitute of stockings. I cannot describe what my feelings were that I had no articles of woolen clothing to distribute especially as the chaplain told us, there were plenty to take their names but few to relieve their wants. Next, we proceeded to the school house at Bakersville, where so many of the 5th had been left without supplies. Imagine our indignation to find that the requisition we had left for them with the commission at Sharpsburg had been cut off fully one half on every article. They probably were not expecting we should be on the track again. Studying Antietam, I tend to get caught up in the battle action, but the aftermath is easily as important to an understanding of the event. I don’t know exactly why things were this bad around Sharpsburg that Autumn. Some of Fogg’s observations suggest small minded-ness or incompetence in those who were responsible, and I’m sure she’s right about them, but I suspect the sheer numbers of patients overwhelmend an already feeble system. The Sixth was on the Maryland Campaign in Franklin’s VI Corps, and fought at Crampton’s Gap, but saw no action at Antietam. The photograph above and text of the Fogg letter are from the Maine State Archives. Could also be that at this still early date, the Medical evacuation and recovery system was still developing, still being mostly focused on the immediate battlefield evacuation of casualties. The echelon’s above that level were still being developed. The one thing that strikes me is that as late as the Overland campaign, the Medical Corp is still out of the loop as far as knowing where the Army is moving and when. I think you’ve got some good points. Certainly about the structure of Army Medicine.